State media carry limited details of the protest that erupted in Guangdong province over a planned chemical plant, but the BBC's Beijing bureau has been piecing together what happened using eyewitness accounts and reports from netizens. In the last few days, a document has been circulating on social media. It asks middle school students to agree to support a paraxylene plant soon to be built near their homes in Maoming City in southern China's Guangdong Province. Paraxylene is a chemical used in fibres and plastic bottles, but in recent years many Chinese residents have expressed concern over its impact on people's health and the environment. The Maoming government seemed eager to prioritise the city's development, however. "To make Maoming a world-class chemical industrial base, the paraxylene projects should be actively and steadfastly promoted, so as to help develop our city and preserve our social stability," the document - which the BBC cannot verify - reads. By signing the document, people agree to "never participate in any activities that go against or hinder the construction of the project". Perhaps the Maoming government saw this coming. On Sunday, crowds of protesters turned up in front of the government office with banners calling for a halt to the chemical plant, and violence soon erupted between police and the protesters. State media have played down the protest but accounts from eyewitnesses, plus images and video circulating on social media paint a different picture. "Maoming people are very unhappy," said Mr Dong, a local resident who participated in the protest and called the BBC. "Maoming has always been a chemical industrial city. Sometimes walking on the streets, you can't even escape from the awful smell discharged from the chemical plants." Mr Dong said that on Sunday morning, protesters started throwing mineral water bottles at the gate of the government building. A few hours later, clashes began and people were beaten by riot police with clubs. After sunset, furious crowds gathered again in front of the government building and burned what they said was the mayor's car. People also set fire to a police car and the security stand near the gate of the government building. Mr Dong said police dispersed protesters with tear gas and pepper spray. 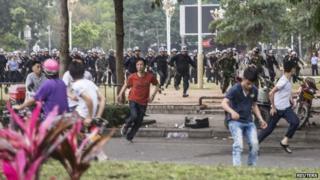 He said one man fell off his motorbike and died while being chased by police, and an entire floor of Maoming People's Hospital was taken up by people injured in the protests. Photos and videos Mr Dong gave to the BBC showed police, carrying long clubs and what look like tear gas guns, running after protesters. A video shared by another woman who contacted the BBC showed a woman crying near a man being beaten to the ground with riot police stepping on him. These cannot be verified - both contacts were unable to identify the specific time and place where the footage was shot, saying they received them from friends caught up in the violence. In the past few days, however, several more people have called the BBC from Maoming city, telling us that the Meihua area, where protests first took place, has been closed off by police. In some locations, mobile phone services have been suspended, they say. One man who wouldn't give his name said police had been checking people's phones randomly on the streets in an attempt to delete all videos and pictures from the protests.